He's known as the "Comeback Kid," and for good reason. Team U.S.A.'s J.R. Celski suffered a gruesome injury (think blood on the ice) right before his first time competing in the Olympics, but made it through in time for Vancouver's 2010 Games. The 23-year-old two-time bronze medalist returns again in 2014 as a member of USA's speed skating team, this time with a clean bill of health and greater determination to bring home the gold. The California-born athlete began his speed skating career at the age of three, when his parents gave him a pair of Playskool plastic roller skates. The rest is history. While some of us can only dream of winning an Olympic medal, Celski went on to take five medals at the 2009 World Short Track Speed Skating Championships. And it didn't stop there — he's also a sixteen-time World Cup medalist. Did we mention he also set a world record? 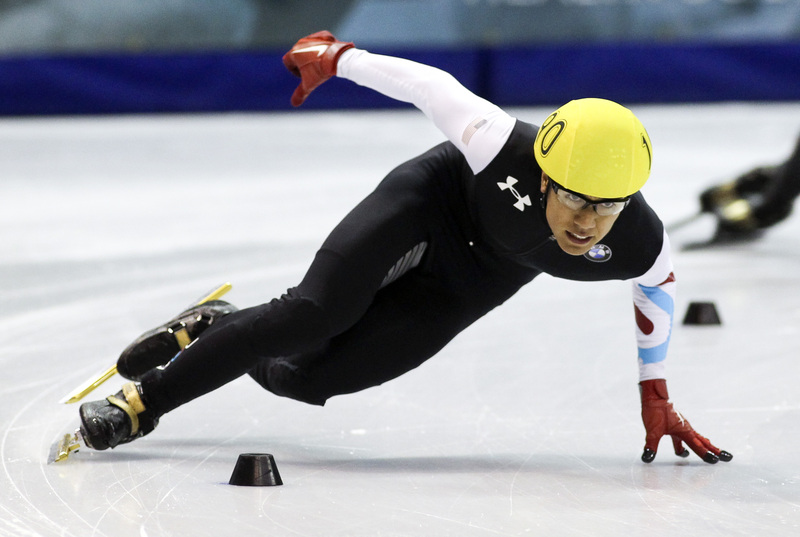 In 2012, he became the first short-track speed skater to break the 40-second barrier at 500 meters. The road to the top was hardly a catwalk. On the last day of the Olympic Trials for Vancouver's 2010 Winter Olympics, Celski slashed his leg while skating on the ice, putting six inches of the skate's blade into his quad and sending spectators and fellow athletes into a frenzy. It took 60 stitches to sew up the gash. He had just five months to recover before the games began, where he won his first Olympic medal, then his second. Not too shabby. After what we can only imagine to be a mentally and physically grueling couple of months, he took a break from speed skating to film a documentary about hip-hop in the Seattle area, including artists Macklemore and Ryan Lewis. “In the lead up to Vancouver, I was really connecting with their music and their message,” Celski told NBC. The musical duo was on the rise at the time. This year, they grabbed seven Grammy award nominations. And Macklemore? He and Celski supported each other through filming, sharing an unlikely bond through similar struggles. "That was the first athlete, or anybody really famous at all, to really acknowledge me,” he said. If that's not a compliment, we don't know what is.